Ostriches are unique creatures. Of all the birds that exist today (roughly 8600 species), ostriches are the largest, reaching a height of 9 feet and a weight of 300 pounds. They cannot fly, but they can surely run, reaching speeds up to 50 miles per hour. The thing people most often equate with the ostrich is this statement, “It buries its head in the sand.” While the statement is technically not true (it lowers its head to the sand when it senses danger), it is a statement that describes lots of people. Her story is not unique. Many others do the exact same thing. They do not want to face their own problems. They would rather bury their head in the sand and tell themselves it is someone else’s fault. The reason they have such trouble getting along with family, friends, work associates and fellow church members is because those people are not doing right. Can it really always be someone else’s fault? No! If you are one who finds himself in constant relationship turmoil, it is time to pull your head out of the sand. You are the common denominator. Maybe you have been caught up in the Ostrich Syndrome. Maybe this email is hard for you to read because it is convicting to your heart. Instead of dismissing it as another attack, why not be honest enough to ask God about it. In your strained relationships, check yourself to see if you might be the main cause of the conflict. There is a miracle with your name on it… IF you will let God unleash His healing power in your heart. Discover How to Rise Above Your Discouragement! 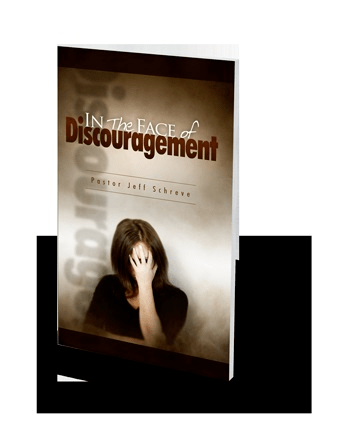 To help you understand and overcome discouragement, Pastor Jeff Schreve shares four life-affirming principles from the book of Nehemiah in his inspiring booklet titled In the Face of Discouragement. And it’s our gift to thank you for your donation below to help lead others into a genuine love relationship with Jesus Christ.